Those of us who are lucky enough to share our lives with horses know the tremendous affect they have on our lives. But what about the lives of those struggling with chronic disease? 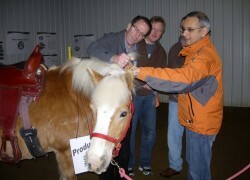 At the front of the equine assisted activities continuum is therapeutic riding. The traditional picture of a child with a disability riding a horse is what we see most. However, that picture is growing to include so much more. 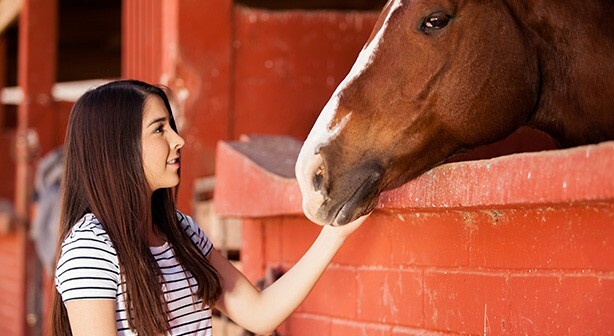 Structured interaction with horses on the ground or in the saddle can do so much for people who are faced with a chronic condition such as multiple sclerosis (MS). MS is a progressive disease of the central nervous system. Multiple Sclerosis causes white blood cells in our body that normally fight off disease, to attack the outer sheath, or myelin, of the nerve fibers causing a disruption in the signals coming from the brain to the body. This disruption in the signal can lead to varying degree of neurological symptoms including loss of vision or motor control. It is most commonly diagnosed between 20 and 50 years of age and is and is one of the most common neurological disorders and causes of disability in young adults. It is more common in women at almost 2 to one compared to men. While the exact cause of the disease is not known, it is speculated that it is caused by a virus though it is not contagious. It is estimated that over 7,500 Hoosiers have MS and nearly 400,000 nationwide. There are multiple types of MS and effects each person differently making it unpredictable and difficult to stay on top of. Things like temperature swings, stress or lifestyle can all exacerbate the condition. When a person who has MS experiences an attack or relapse, it can drastically reduce their ability to be independent. This fact alone makes it imperative for MS patients to have a strong support network, outlet for physical activity and strong skills for coping with stress. What better place than a farm with horses to provide all of that in a one stop shopping experience. Dr. Janicki, a prominent neurologist in Indiana has had several patients describe the benefits they gain from equine assisted work as a part of their overall treatment and healthy maintenance. It is widely accepted that the movement of the horse can help increase blood flow, strengthen muscles, improve flexibility and promote cognitive development. Amazing research coming out of the Hippotherapy side of the equine assisted pie has demonstrated many of these benefits. The three dimensional movement and mastering the skills needed to ride also inspire confidence and a general sense of wellbeing making it extremely beneficial. When lessons are facilitated by an instructor who can adapt the riding for the ever changing conditions of the body, the rider can learn to meet their body where it is each time they show up helping to roll with ups and downs of this disease. Of course we can’t overlook the emotional benefits. 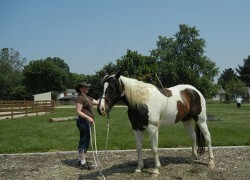 Just spending time with a horse can lower blood pressure and promote a sense of peace throughout our inner landscape. This peace can carry over into everyday life and help ease the tensions and stress that can bring about a flare up. Equine assisted learning, a more coaching based approach, can help patients learn to deal with the chronic pain and teach specific skills that can be employed for the rest of their life. Whether or not people with MS choose to participate in equine assisted activities as a part of staying healthy and strong, expanding their network of resources is imperative for a good prognosis. There are many local organizations throughout Indiana that help provide support, education and options such as the Indiana chapter if the National MS Society and events like One Day for Everyday. Events like these and supportive doctors like Dr. Janicki open up a wider scope of possibility for patients with MS which includes therapeutic riding and equine assisted activities to their treatment plans. Horses give so much to our lives and provide a perfect opportunity for holistic health when we interact with them. Through this interaction we learn that a midst the ugliness of everyday life, there is always beauty in nature.